Fundi has grown up, since the age of five at the HOKISA Children’s Home in Masiphumelele, and has been a learner at Bay Primary School. His special HOKISA father (also HOKISA board member and Clovelly resident) Perry Tsang tutored him over the years. Both are so proud of such an achievement of a potential international circus career. 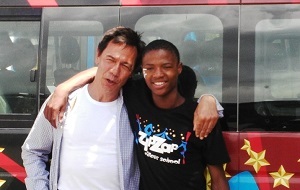 Fundi can be seen in two acts (unicycle and trampoline) in the present ZipZap show at the open air theatre at V&A Waterfront 14 – 20 December and again 13-16 January (daily at 16.00 hrs). In 2016, a tour is planned to Namibia. Awesome and positive post about circus. I hope this will give a good inspiration to the readers. Good share about such an achievement. Thanks for sharing this nice post in an interesting line of content, Its a great way of bring this topic to discussion.